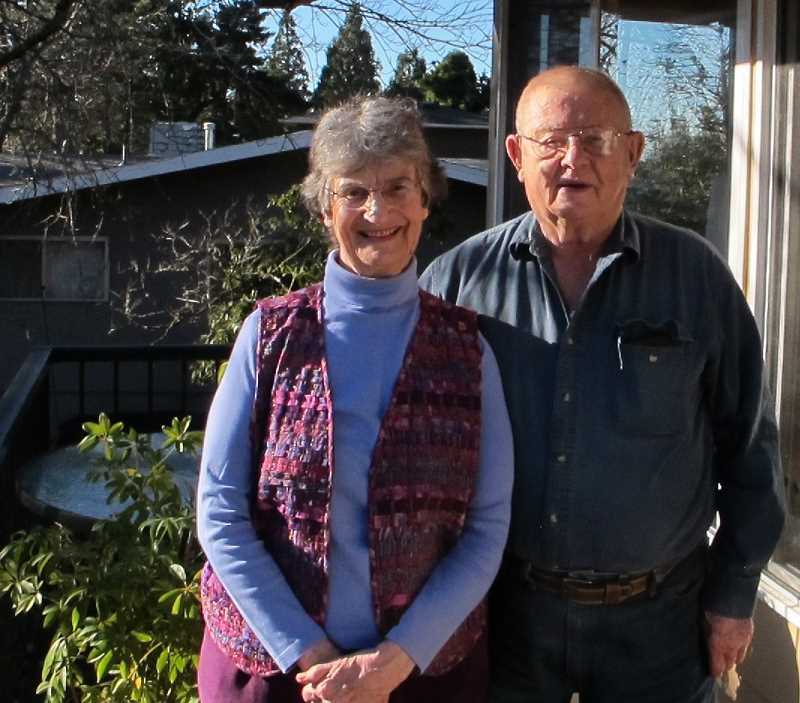 A couple of Southwest Portland married couples with 130 years together between them recently agreed to give Southwest Connection readers a Valentine's Day gift: Their secrets to staying together. Helen and Jim Pasqualone got married in Pasadena in 1949. He trained to fly B-24 Bombers in World War Two. ("Never flew a mission. They dropped the bomb.") She was a "Rosie Riveter," working on the assembly line manufacturing the B-25 in Kansas City, Mo. Jim shows off the receipt for Helen's wedding dress: $52. "But I was only making a buck-25 an hour back then," he says. Helen now lives at West Hills Village on Multnomah Boulevard. She has an apartment there. Jim lives in the same house they moved into 22 years ago in the Claremont development of Northwest Portland. He spends at least four days per week with Helen. She's 95. He's 96. "Jim is a good guy," she said. "He's not pushy. He's why we've made it so long. There was so much to worry about when we were first married. We were trying to get money together and all that stuff. Jim was always there." They had four children in Los Angeles but lost a daughter to leukemia when she was 15. One grown child lives in Portland, Maine, and the other in Portland, Oregon. They have five grandchildren and 20 great grandchildren. "The secret to staying married 70 years," said Jim, "is you've got to find someone who has the same likes and dislikes the you have, if possible. We are both Catholic so there were no religious arguments there. "You've got to listen to each other. Listen to your mate's wants and what she likes and her troubles and talk about it. Resolve them." Finally, added Jim, "After you meet someone that you're compatible with you've got to have a stable source of money, a steady income. Money is what causes too many divorces these days. Or lack of money." 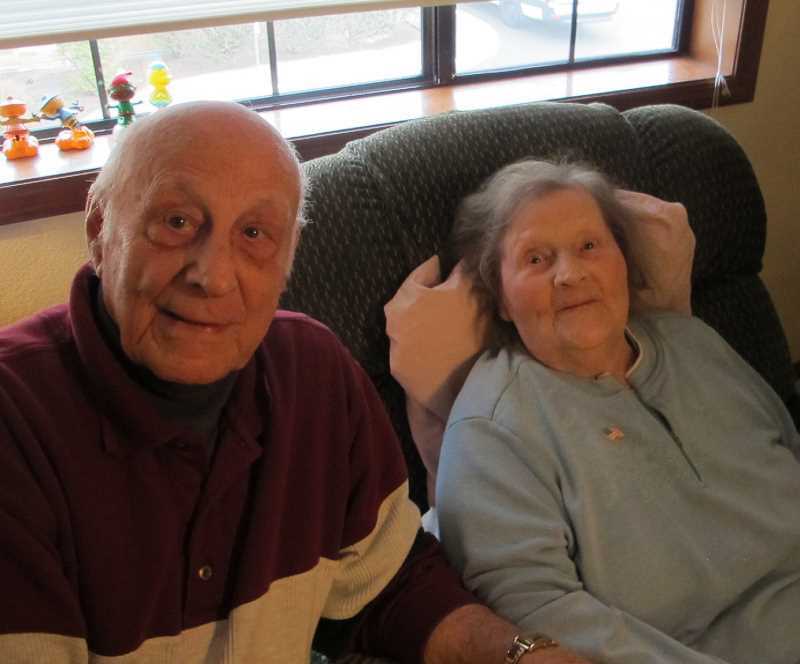 Marge and Dave Hartmann of Hillsdale got married in Madison, Wis., on the day after Christmas in 1959. Marge was a teacher at the time and used vacation time for her marriage and honeymoon in New Orleans. Dave was an electrical engineer teaching at the University of Wisconsin. "She's very accommodating," says Dave. "If I'm off on a wild chase she slows me down but doesn't pick a fight." Marge laughs and says, "Actually we still are very happily married and we still love each other very much and that is almost miraculous, when you think of human nature." Marge is 81. Dave is 84. They met at a student co-op dining hall on campus ("Seven dollars a week for 11 meals," recalls Marge) while she was taking courses to be a librarian and Dave was deep into engineering academics, eventually earning his doctorate in electrical engineering. Marge says, "So he's my nuts-and-bolts guy. David could fix anything." Ever the engineer, here's what Dave said when asked if the difference in their occupations might have actually made the marriage stronger: "It's possible, but that's not something that I'm absolutely certain of." Marge echoes the idea that money matters should not be allowed to wreck a marriage. "We didn't want to get in debt," she says. "We never got in debt. Only a mortgage. Dave fixed more second-hand stuff for us. We didn't buy new at all." Marge says she and Dave were too busy to let the turmoil of the '60s take a toll on their marriage. "The first 10 years of our marriage we were totally enveloped in raising children." The Hartmanns had four children in five and a half years and took in 13 unwed mothers. "At the time they would be ostracized," says Marge, whose aunt was a nursing nun. One of her nursing students was pregnant, so she went to live with the Hartmann family. Marge and Dave live in the same house they moved into 44 years ago across the street from Robert Gray Middle School. They are members of River West Village, which offers them a pretty active social life. Finally, Marge says their long, strong marriage is a gift from their parents. "We both come from parents who loved each other and gave us a bountiful, beautiful sense of what a marriage should be," she says. "We grew up in happy, loving homes and we went on to make our own happy, loving home." Neither the Hartmanns nor the Pasqualones have any special plans to celebrate Saint Valentine's Day.